The statement written above means that a is a special variable(i.e. pointer) that will store an address of another variable which is integer. 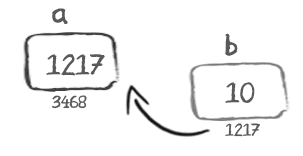 Here 3465 is address for variable a and 1217 is address for variable b. It will not mean that a will store character it means that it will store the address of some variable whose datatype is char. OK so far, but I think someone that this helped would need a lot more - for example the dreaded pointer arithmetic - dreaded because it causes so many bugs.